Down by the beautiful sea this wonderful year round well maintained Beach House is just a short walk to South Village Beach. Boasting a flowing floor plan great for entertaining, 2 bedrooms with large loft for kids or overflow company, great kitchen layout that lets chef interact with family and friends plus 12x22 family room with A/C and heat! 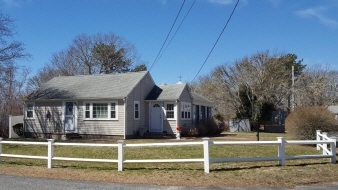 Utility room with washer & dryer, forced hot water heat, large storage shed on a nice level lot just 4/10 mile to beautiful Nantucket Sound. All information deemed reliable but not guaranteed. Buyer/Buyer Agent to verify all information contained herein.